Irish Early Christians, Not So Christian After All? Excavations at Caherconnell in the Burren region of county Clare on Ireland’s western coast are revealing some interesting practices undertaken by Ireland’s early Christians. It is traditionally accepted that Christianity arrived in Ireland some time before the middle of the 5th century AD. You might be forgiven, then, for assuming that Christianity and Christian practices could be found throughout Ireland within a century or two of this date. On a low rise to the side of a shallow valley in a place that later became known as Caherconnell in western Ireland an elderly woman and two babies were buried. Their remains were placed in two carefully constructed stone boxes called cists, both covered by a single low mound of earth and stone. This took place in the second half of the 6th century AD / first half of the 7th century AD. Recent excavations by the Caherconnell Archaeology Field School are proving otherwise. It was discovered in the summer of 2013 that Caherconnell cashel or ‘caher’ (a circular drystone enclosure containing dwelling houses and other domestic structures) had been deliberately constructed over the top of an earlier burial mound. This small mound covered two limestone cists. Although disturbed at one end, their contents were still present. The smaller of the two cists contained the remains of a young child, between one and two years of age, and the bones of a baby who was either stillborn or died shortly after birth. The larger cist was only partially present inside the cashel, the rest of it being buried beneath the 3m-wide cashel wall. It contained the skeleton of a woman, at least 45 years of age. She suffered from joint disease, probably as a result of much physical labour over the course of her lifetime. The results of radiocarbon dating have just arrived, dating the human remains to 541-645 AD and 535-649 AD. This places them well within the chronological bounds of what was once termed ‘Early Christian Ireland’. Clearly, though, these people were not buried in a purely Christian fashion, rather in a mixture of traditional pagan and newer Christian burial practices. Following the Christian tradition, the bodies were unaccompanied by grave goods and were laid out almost east-west. They were not, however, interred in a Christian cemetery. Instead, they were placed in slab-built cists beneath a low stony mound. Such cists and mounds are commonly found in the pre-Christian prehistoric past. These people appear to have combined their traditional belief system with elements of the ‘new’ religion – hedging their bets maybe?! The story of these people does not end there. Several centuries after their deaths, in the 10th/11th century AD, the high status cashel settlement called Caherconnell (the caher or cashel of Conaill) was built at this location. The builders of this new home did not clear this mound and its contents out of their way, nor did they site their enclosure so as to avoid the mound. Instead, they built the drystone wall of their enclosure directly over the top of the mound, leaving approximately half of the mound intact and visible inside the new enclosure. It seems probable that knowledge of the mound and what it contained survived into the 10th/11th century AD, and that the new occupants of the spot deliberately incorporated these ancestors into their settlement. Was this, perhaps, an attempt to legitimize their rule of the area? Like the earlier burials themselves, this practice also has pre-Christian associations. Summer 2014 will see the Caherconnell Archaeology Field School excavate the centre of Caherconnell cashel. The main dwelling house is typically located in this part of the settlement enclosure. With almost 700 artefacts recovered from ‘open’ space inside the enclosure entrance, hopes are high for a very rewarding season this year! Caherconnell cashel is the largest of four drystone enclosures in the townland of the same name, in the Burren, Co. Clare. 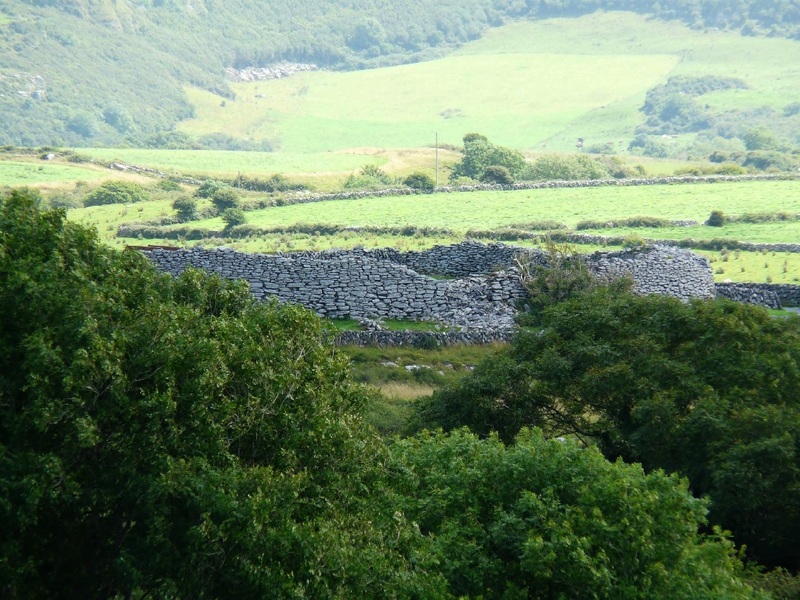 Cashels are the stone equivalent of the more numerous ringforts – typically enclosed farmsteads housing a single family with most built between the 7th and 10th centuries AD. Much as today, the larger settlements reflected wealth and status. Caherconnell is one such settlement. It is, however, exceptional in other ways also. An international field school was established in 2010 to undertake research excavations at the cashel. Work to date has revealed that this cashel was built at the end of the traditionally accepted date range for ringforts, in the 10th/11th century AD, and that it continued to be lived in right up the start of the 17th century. It is uncertain who built the enclosure, but it was owned by an important branch of the local Gaelic rulers, the O’Loughlins, in medieval times. They lost possession of Caherconnell right about the time that the archaeological evidence revealed occupation ended within the cashel. It is highly unusual to find a settlement of a Gaelic noble family from medieval times, even more unusual to discover that they were choosing to live as their ancestors (the people of the earlier ringforts) had before them. This may have been a deliberate choice, proclaiming their ancestry in a changing world where intrusive groups from outside (initially the Anglo-Normans, later their English descendants) were threatening the native way of life.